After several years, it is possible that your pool might not be bringing you the enjoyment it used to bring. Maintaining a pool is hard work, and for many homeowners, it is simply not worth it to continue the upkeep. If you are beginning to feel the same way, it may be time to schedule pool removal services. After updating your backyard, you will have access to a full range of options when it comes to landscaping after pool removal. Take a look at some of the enhancements you can enjoy in your backyard after finally getting rid of your underused pool this season. Removing your pool is a big investment that can ultimately save you a significant amount of money. Homeowners’ insurance policies are typically higher for homes that have a pool, and removing the pool can therefore bring you instant savings. Equipment can also be expensive. Repairs must be conducted immediately to help avoid larger problems, and this can include the replacement of expensive machinery and other parts. Pool owners should also purchase chemicals on a regular basis, adding to the expenses. Finally, many pool owners choose to hire professional cleaners or install additional security measures. While these can save time and bring peace of mind, they also represent additional expenses. Replacing your pool with a different landscaping feature can also save time. Pool owners can spend several hours each week maintaining their pools. This can include inspecting equipment, balancing chemicals, cleaning, and shopping for necessary pool components. By removing the pool, you can regain some of the time previously spent on these chores and enjoy spending more time with your family instead. As fun as they can sometimes be, pools can bring a great deal of stress with them. 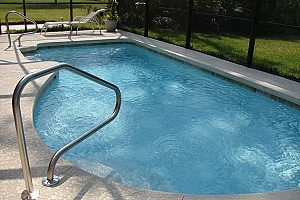 They require proper maintenance year round, and many homeowners worry that changes in the weather or accidentally closing the pool carelessly will cause more headache when it comes time to begin using the pool again. For families with small children or pets, it can be difficult to ensure that the pool area is safe and secure before allowing them into the backyard. These stresses can make it more difficult to sell the home later. In many cases, people who have never had a pool before may hesitate to purchase a home with a pool, as they would prefer to avoid creating more work for themselves by maintaining the pool and keeping a careful eye on it. After removing your pool, you will have created new space in your backyard for unique landscaping ideas. It is important to ensure that the ground is properly prepared before you begin. Depending on your ideas, you may need to grade the land, secure fill dirt, spread topsoil and grass over the area, or ensure that the soil within the filled area is sturdy. Doing this work before you begin your landscaping project can make the process smoother and help you avoid costly mistakes along the way. One of the most common options for landscaping after pool removal services is to begin a garden area over the new ground. This garden can be complex, with different spaces for different types of plants and flowers, fountains, benches, and other decorative elements. Many homeowners choose to keep things simple, though, and plant a few favorite and low-maintenance flowers or trees. In both cases, you will want to ensure that the top level of dirt consists of rich topsoil with plenty of organic matter to provide nutrients for your new garden. Consider adding a sturdy but attractive fence around the area to keep curious pets and small children from damaging your plants as they grow. Now that you have some extra space in your backyard, it may only be fitting to maximize its practical uses as a space for entertaining. During the warmer months, a patio may be the perfect place to gather. Brick and concrete patios can easily be made to fit exactly the space you need them to fill, and colorful furniture — like outdoor sofas, umbrellas, and lounge chairs — can create an inviting space. If you are particularly inclined to throw parties and other gatherings, you might want to consider adding an outdoor kitchen area with a barbeque, wood stove, and other cooking utensils and tools to keep you in the midst of the festivities while you take care of your guests. Both full and partial pool removals result in ground sturdy enough to support small structures. You can add a shed for storage, which can help keep your new backyard organized and beautiful with minimal effort. 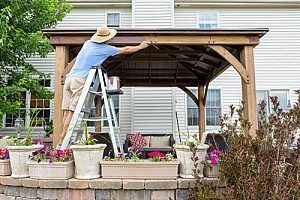 Gazebos, pergolas, and other overhead features are also a unique twist for your backyard. These features can create an elegant vibe in your backyard, particularly if you allow climbing vines and plants to grow through the support beams. These surprising elements can help your yard truly stand out. What if you just cannot decide between a few landscaping options? In this situation, creating a multi-leveled yard might be the perfect solution. Using fill dirt and leveling techniques, you can create a strong demarcation between two areas of your yard or a more gentle slope, depending on your preferences and backyard goals. This leveling makes it easier for you to incorporate multiple landscaping elements in a more cohesive manner. It also helps provide visual distinctions between different areas of your yard and their uses, providing dedicated space for parents and kids or various types of activities. Contact Dirt Connections to begin the process of removing your pool. 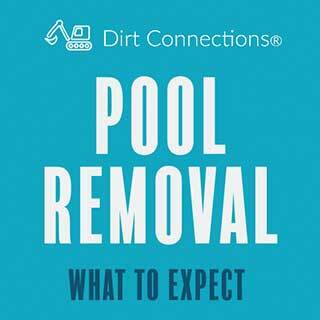 Dirt Connections’ experienced pool removal contractors provide free estimates and can help you select the best pool removal process for your needs. The company also delivers free fill dirt, which you may find useful for your landscaping projects after your pool has been removed. 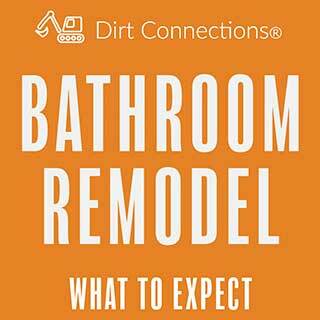 Dirt Connections can also assist with a variety of other home improvement projects, including additions and remodeling, asphalt and concrete paving, dirt grading, foundation repairs, and construction plans for new buildings.